There are more than 3 million new cases of Degenerative Disc Disease every year in the United States. At least 30 percent of people ages 30 to 50 years old will have some degree of disc degeneration with or without symptoms or formal diagnosis. Over the age of 60, it is normal to have some degree of disc degeneration of the spine. There is a genetic component to this disease. 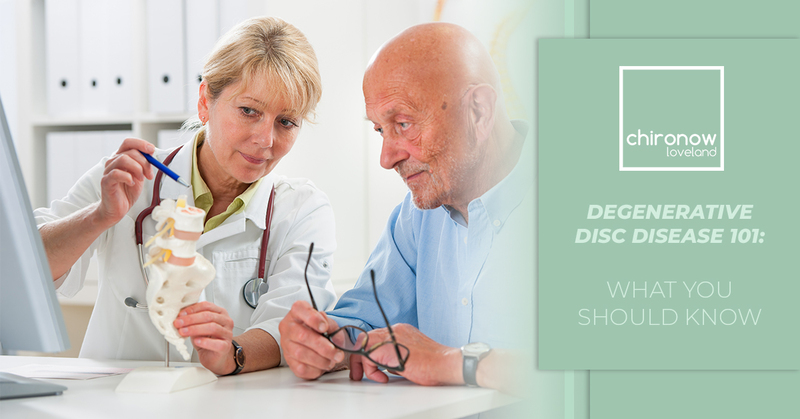 However, disc degeneration is more the result of simple wear and tear, age or trauma. Seeking alleviation for your back pain from degenerative disc disease? Reach out to our chiropractic office today. Our chiropractor at Chironow Loveland will be more than happy to assist you. For your convenience, we offer walk-in services, so no appointments are necessary. Degenerative Disc Disease is a condition of the discs between the vertebrae with loss in cushioning, herniation and fragmentation due to aging. In more severe cases, the spine loses flexibility and bone spurs develop pinching nerves, resulting in pain and weakness. Unfortunately, there is no cure. However, chiropractic adjustments have been shown to improve symptoms and disease outcomes. Symptoms of DDD may include pain in the lower cervical and lumbar spine with radiating weakness or numbness stemming from the degenerative disc or discs. The pain associated with this disease is caused by inflammation from the proteins within the disc space. The inflamed discs then impinge the surrounding nerves causing pain that can be localized or radiating to extremities. Lumbar Disc Degeneration has another cause called abnormal micro-motion instability. With LDD, the outer disc rings, called annulus fibrosus, become worn down causing an inability to absorb stress on the spine. Inflammatory proteins within the disc combine with excessive micro-motion can cause ongoing debilitating low back pain. Therapies for Degenerative Disc Disease include chiropractic care, medication, surgery, applying heat, physical therapy and physical exercise. Chiropractic adjustments help by improving spinal motion and joint mechanics by reducing inflammation, which then reduces pain. Adjustments also help to improve circulation, especially to the spine, which helps to bring proper nutrients to the injured disc or discs. The art of chiropractic care treats the “whole” person— not just symptoms. By manipulating the whole spine, the body and brain communicate more efficiently. At Chironow Loveland, we believe in treating the “whole” you. Whatever your chief complaint may be, from disc degeneration to headaches, we will give you a full-body adjustment that will improve your overall wellbeing. We have a wide range of packages the will save you time and money. Best of all, you can share them with your family! Walk-in today for a much better tomorrow.